How ants and plants interact over space in the Amazon? I protect you and you feed me, says the ant to the plant…read more about ecological networks in the new Early View paper “Spatial structure of ant–plant mutualistic networks” by Wesley Dattilo and coworkers. In tropical environments, ant diversity is extremely high, reaching approximately 500 species at local scales. 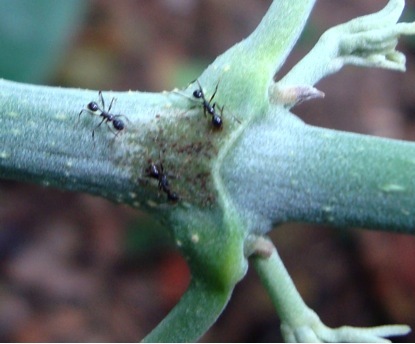 Because of both their abundance and diversity, it is extremely common to see ants foraging on plants. Within a spatial environment with a remarkable diversity (eg. Amazon rainforest) different plant and ant species can interact with each other and generate complex ecological networks of interactions. 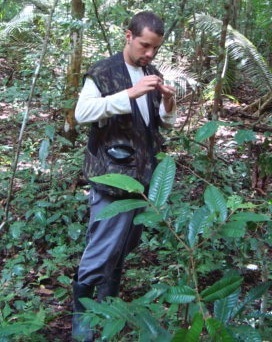 In this study, we studied how ants and plants with extrafloral nectaries interact over space, and we show that although the ant and plant composition of networks changed over space, the highly connected plants and ant species, and the structure of networks remained unaltered on a geographic distance of up to 5,099 m in the southern Brazilian Amazon. These finding indicate that different populations of plants and ants can interact in the same way independently of variation in local and landscape environmental factors. Therefore, our study contributes to understanding of the maintenance of biodiversity and coevolutionary processes in ecological networks. Ants collecting extrafloral nectar on a plant in the fieldwork. « Welcome Sa Xiao, new Oikos Editor!